It's my pleasure to welcome Nancy Herkness back to The Romance Dish! Nancy is the author of the award-winning Wager of Hearts and Whisper Horse series, published by Montlake Romance, as well as several other contemporary romance novels. She is a two-time nominee for the Romance Writers of America’s RITA® award. 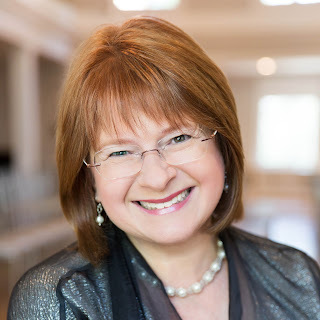 Nancy is a member of Romance Writers of America, New Jersey Romance Writers, and Novelists, Inc. She has received many honors for her work, including the Book Buyers Best Top Pick, the New England Readers’ Choice award, and the National Excellence in Romance Fiction Award. She graduated from Princeton University with a degree in English literature and creative writing. Welcome back, Nancy! It’s always a pleasure to host you. I have thoroughly enjoyed each of the stories in your Wager of Hearts trilogy. Please share with our readers what they should expect from these three books. PJ, it’s ever and always a delight to be your guest on the Romance Dish. You ask the best questions. 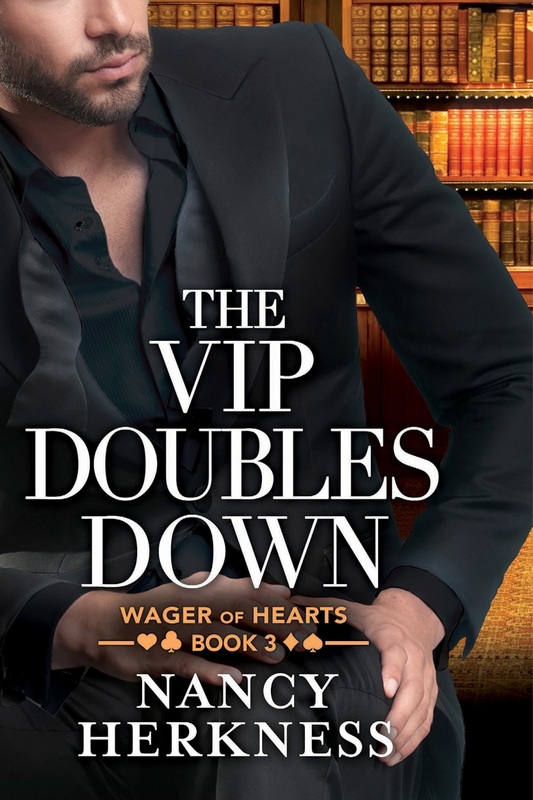 I love my Wager of Hearts billionaires, so it makes me sad that The VIP Doubles Down is the last book in the series. Of course, my next series is set in New York and also features ultra-wealthy heroes which means there’s a good chance that some cameo appearances will occur. What to expect? My three self-made billionaires—a CEO, a quarterback, and a bestselling author--meet in the bar of an exclusive New York club and discover a common problem: money gets in the way of love. So they make a bet on finding the women who can love them for themselves and not all the trappings of their wealth. Each book traces one man’s journey of the heart. I take readers into the world of the hyper rich: mansions, penthouses, private jets, glamorous parties, designer clothes, and fast cars. All these things could easily dazzle my working girl heroines, but they are well-grounded, fiercely independent women who see past the sparkly package to the men who need their love and understanding to be whole. and I have to say, Gavin’s story was well worth the wait. What would you like readers to understand about this brooding author hero? I am delighted to hear that you enjoyed The VIP Doubles Down. It’s a book of my heart. Gavin covers his pain with his biting wit. The truth is that he’s quite sensitive underneath all the snark. He has a lot of issues from his past that could have turned him into a bitter man; instead he has channeled his desire to escape into a hugely successful career as a writer of spy novels. But it’s lonely at the top and he needs the warmth and healing of Allie, his new physical therapist. As with the previous two heroines in this series, Allie’s life is so far removed from Gavin’s billionaire lifestyle, they may as well be from different planets. What qualities does she possess that convinced you she would be the right heroine for Gavin? Gavin has many wounds and Allie is a healer by nature. She’s also warm, generous, and without pretension. His former fiancée, the actress Irene Bartram, was none of those things, so Allie makes a wonderful antidote to the poison Irene poured over Gavin’s heart. But Allie is no pushover; she calls on her country-girl strength to stand up to Gavin’s strong personality when he tries to walk over her. As a result, sparks often fly between them. Pundits often advise people to “write what you know.” I’m curious. As an author, were there any unique challenges in creating a fictional author as the hero of this book? Quite the opposite. I understood Gavin’s problems so well that the book just flew from my madly typing fingertips. I love the way he uses words to mask his wounds and vulnerabilities. In Luke’s book, The All-Star Antes Up, when I revealed that Gavin is a romantic at heart, some readers were surprised, but I knew it all along, of course. For some reason, the third books in my trilogies seem to gravitate toward darker heroes and deeper emotional issues, and Gavin is no exception. But I love my tortured heroes the most because they make me cry, first with sadness and then with joy when they find the soulmate who will heal them. Readers of your Whisper Horse series will no doubt enjoy the crossover characters in The VIP Doubles Down while others, like me, who haven’t read those books yet will likely be intrigued and want to know more about Sanctuary, West Virginia and the fictional characters who live there. What should readers new to the Whisper Horse series expect from those stories? Do you plan more crossover characters for future books? I’ve become addicted to crossover characters. Even in my earlier standalone books, I have the main characters from A Bridge to Love show up for cameo appearances in Shower of Stars and Music of the Night. When I fall in love with characters, I just can’t let them go. In fact, I’m working on the first full-length novel in my new Second Glances series, and I’ve already written a scene between the hero and Nathan Trainor from The CEO Buys In. It even takes place at the Bellwether Club. I didn’t plan for it; it just popped into my writer’s brain. The Whisper Horse novels spring from a different part of my life: my childhood in a small town in the mountains of West Virginia. 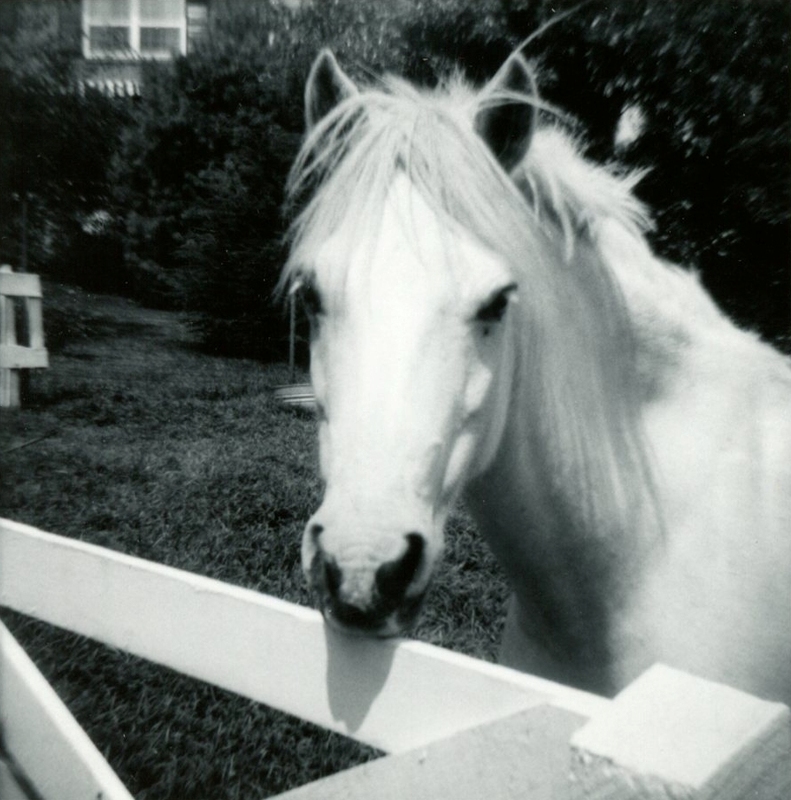 During those years, my pony, Papoose, was my best friend and confidante, giving me the idea of every person needing a special “whisper horse” who helps share the burden of their problems. I would whisper my teenage angst into Papoose’s ear and feel better for doing it. Tim and Claire, who make the brief appearance in The VIP Doubles Down, are from the first Whisper Horse book, Take Me Home. The Whisper Horse novels are titled with phrases from Almost Heaven, the famous John Denver song about my mountain state, because the setting is integral to the stories. Allie may be meeting Gavin for the first time when she accepts a position as his physical therapist but she’s no stranger to his dashing fictional hero, Julian Best. In fact, Julian has starred in many of her dreams and fantasies. Have you ever had a book boyfriend? What made him stand out above all the others? True confession: I’m a bit fickle in my book boyfriends. I’ve had many. The first was Mr. Rochester in Jane Eyre. I melted over his dark, brooding edge of mystery. Then Mr. Darcy. No explanation necessary. I adore Lord Damerel and the Marquis of Vidal in Georgette Heyer’s Regency romances. Both are untamed rakes with that delicious hint of dissipation. There’s nothing more satisfying than seeing the heroine bring them to their knees. Damerel and Venetia trade literary quotations which utterly delights me. The Marquis of Vidal is a very bad boy, who still makes me sigh. For more modern heroes, I’m still madly in love with Dan Calebow in Susan Elizabeth Phillips’ It Had to Be You. He might have fed into my creation of Luke Archer in The All-Star Antes Up. There’s something about the drive and discipline required to be an elite-level athlete that makes my pulses race. Not to mention their perfectly honed bodies. Sad to say, I could go on, but I’ve proved my point: I love the one I’m with. Allie’s pet cat in this story is inspired by a very special real-life feline who shares your life. Please tell us about Pie. Ah, Pie, the cat who came for Christmas…and stayed. Let me preface this story by saying that I already had two dogs. I did not need a cat. Pie, however, had other ideas. 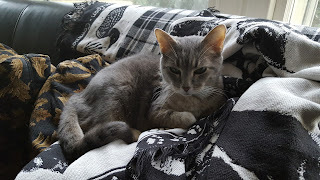 My daughter, Rebecca (who is now a veterinary student at Iowa State), worked at a homeless cat shelter in Pittsburgh where she found Pie, the little gray cat whom no one would adopt because she had multiple health issues and didn’t get along with other cats. She had nearly been euthanized because of that. Pie was no dummy. She curried my daughter’s favor by greeting her with loud, enthusiastic meows, purring every time she was touched, and showing a decided preference for her company. Pretty soon Pie had moved into Rebecca’s apartment as a foster until someone was found to give her a permanent home. When my daughter came home for Christmas, of necessity, Pie came with her…only for the holidays. When Rebecca returned to Pittsburgh after the holidays, Pie somehow remained behind. And thus their goal was achieved: Pie found a forever home. Pie is the perfect illustration of a profound truth: Sometimes we don’t know what’s missing from our lives until the universe sends it our way. She has brought unexpected joy and love and comfort into my life. Since Gavin in The VIP Doubles Down is a writer like me, I decided he needed a cat too, even though he didn’t know it. So Pie found her way into his story. The sad news is that Pie was recently diagnosed with a very aggressive form of breast cancer. She’s an elderly lady and has been through three surgeries in the last year. Our vet says that another surgery would kill her, so the cancer will win this time. Right now Pie is doing fine, and I treasure my time with her, whether petting her or having her curled up on my lap or basking in the spring sunshine on our back patio. I loved the concept of the Barefoot Ball that all three couples attend in The VIP Doubles Down. Was this a product of your imagination or fashioned after an actual event? What’s the most unique event you’ve attended? The Barefoot Ball is entirely imaginary. I love the feel of cool, soft sand on my bare feet, so it popped into my head to require all these fancy folks in their ball gowns and tuxedos to go barefoot on the beach in the middle of winter. Of course, there are giant heaters but the sand will still be chilled and delicious on their soles. As for a very fancy real event, I once attended a private party at the Metropolitan Museum of Art when the Edgar Degas exhibit was there (which dates me, alas). When I walked into the grand entrance of the museum, the first sight that met my eyes were actual ballerinas dressed in costumes from the Degas paintings posing on the grand staircase to the music of a live orchestra. I was escorted to the Temple of Dendur for hors d’oeuvres, proceeded to the American Wing for dinner, and then toured the exhibit with only the party guests, no public crowds. As I departed, I received a goody bag containing gourmet chocolates and notecards printed with Degas’ paintings. That was an evening to remember! Gavin’s bestselling books have been made into enormously successful movies. Which of your books would you most like to see on the big screen? Any thoughts on which actors you would want to portray the leads? I think all of my books would make great movies, of course. However, I understand that movies need less internalization and more action, so I would choose Shower of Stars (one of my standalone novels) or The Place I Belong (the third Whisper Horse novel) for a movie script. Both offer plenty of external events to hang the visuals on, but they also offer strong emotional scenes for a really good actor to sink his teeth into. I love casting the heroes of my books; I seem to be less picky about the heroines. I see Colin Farrell as Jack Lanett in Shower of Stars; he has that edge of danger that Jack projects, as well as a dark brooding presence. We’d have to change his accent from Irish to Deep South but I’m sure Colin could manage that. For Adam Bosch, the world-class chef and restaurateur in The Place I Belong, I would cast Hugh Jackman. He has that smooth, charming façade, but there are depths to plumb there. Adam could even be turned into an Aussie for the movie because I love Hugh’s accent. And a few other things about him. I’m just proofreading the kick-off story for my new Second Glances series, a novella titled Second to None. The new series combines billionaires, New York City, children, dogs, and second chance love stories…all my favorite things! Second to None will be released September 12th. It’s set at Christmas time, too. Below is the story summary…and your readers are the first ones to see this! Thank you for sharing us! I'm off to mark the date! I will be at RWA’s “Readers for Life” Literacy Autographing on July 29th from 3:00 – 5:00 at Disney’s Swan and Dolphin Resort. I am also the luncheon keynote speaker at the New Jersey Romance Writer’s “Put Your Heart in a Book” conference on October 14th in Iselin, NJ. Hmm, I need to get out more. Thanks for visiting with us today, Nancy. Would you like to ask our readers a question? I can really like a cover of a book, but if I don't like the blurb, I won't buy the book. On the other hand, a cover will prevent me from buying a book. I do not like explicit covers and wouldn't want to be seen reading them. I didn't read romances for years because of the bodice ripper covers. I found some by Julie Garwood with lovely jeweled broaches on the covers, liked the blurb, and bought every title I could. I have been hooked ever since. Subtle covers, like the one for THE VIP DOUBLES DOWN, are so much better. They leave more to the imagination. I now have book covers for my paperbacks so I am not so concerned. Sorry about Pie. They become such a part of our lives. I hope she is not in pain and can be with you a while yet. I dearly miss our 17 year old lab mix that died 2 years ago. We have a small terrier mix who is 16 and failing. There isn't anything we can do but love her. We have had two cats show up right after we got puppies. Both were kittens and grew up with the dogs. They would sleep curled together, groom each other, and when they were young, play. I am staying far away from our local shelter. All our dogs have be strays or shelter dogs. Same with the cats. We did foster care for the shelter for several years, but it is too tempting to keep a puppy from each liter. The late was from the first litter and the terrier from the last we fostered. We still have two more to keep us company. Three is enough, although we have been up to 5, not counting the foster litters. Thanks for your response to my question on covers. I'm glad you found THE VIP subtle. I think it's the best cover I've ever had on a book. :-) Thank you also for your concern about Pie. She is not in any pain now. I would not let her suffer that. So I pet her and hug her and have lap-sitting time with her a lot. Right now, it's all good. Your household sounds a lot like mine: many random but well-loved animals. That's the best! I told Nancy, via FB, that I prefer her "covered men" covers compared to those with men wearing no shirts and covered in tats. Of course, I'm old as the hills so I guess that's one reason why I prefer clothes on my men. LOL, Martha! You're not old, just very tasteful. UNFORTUNATELY SOME COVERS TURN ME OFF, MY THANKFULLY NOT MANY. AND I HAVE BEEN WANTING TO READ THIS SERIES. THANKS FOR THE GIVEAWAY. So glad to hear you are looking forward to the series! Hope you enjoy it! You're always so wonderful, Martha! Covers can draw me in or turn me off but IG the Blurb is good I buy it, cover or not. Enjoyed the post. So sorry about Pie. But being loved and comfortable at this time will see her through. Carol L., now, of course, I want to know what in a blurb convinces you to buy the book. ;-) It's good to know that a bad cover won't prevent your purchase. Thanks for the kind words about Pie. She's doing well now, so we're just loving her all we can. If it's a new to me author it can make a difference. I pass over some books that have covers that don't appeal, otherwise I will pick a book up and check the back blurb. Best of wishes with Pie. I'm from Pittsburgh and care for ferals and strays so I know how much they take over your heart. Thanks for your response about cover influence! I appreciate your good wishes for Pie. You are a wonderful person to care for feral cats; the clinic where my daughter worked did a lot of work for ferals. Love Pittsburgh! It's a marvelous city. The cove plays a big part in my decision whether or not to buy a book. I also go by the blurb on the back cover, too. I love the cover of "The VIP Doubles Down". That's really sad news about Pie. I know how hard it is to face the impending loss of a beloved poet. Thank you for the chance to win. Thank you so much, Diane D, for your compliment on my cover. I love it! I cried a lot when I first got the news about Pie but I have accepted it now. She's doing so well that sometimes I forget, which is a nice thing. Covers are important but the blurb is how I make the decision about the book. Best wishes and sorry about Pie. Aha, you're a blurb person! Of course, that intrigues me too. What elements in a blurb draw you in? Thanks for the kind words about Pie. Unless the cover is really bad, it does not affect it, especially if it is by a favorite author or the blurb sounds good. Good to know you don't fault a book for its cover. Many people don't realize that most authors who are not self-published don't have control over their covers. I enjoy perusing covers since they catch the eye. I must read the blurb so that I can become familiar with the storyline. Sad about Pie. I like to browse covers too, petite. I'm a visual person (which I think shows in my writing too). Pie is doing well right now, so I'm just enjoying her company while I can. She had a clear chest X-ray this week, which was a great relief. Just wanted to let folks know that Pie had a chest X-ray this week that showed her lungs are clear. That was great news because the vet was concerned that the cancer might have spread there already. She's a fighter, my little gray cat. I was very happy to hear it. Welcome, Nancy! Thank you again for visiting with us today and graciously answering my questions. I'm usually not one to gravitate to billionaire heroes but you really drew me in with these three as well as your billionaire heroine, Frankie. I loved her novella! A cover may draw my attention to a book but it's not the reason I make the purchase. Thank YOU for having me as your guest. Love being here. I'm thrilled to hear that my billionaires converted a non-billionaire reader. :-) I loved writing about Frankie. I've always wanted to write an older heroine; it was a lot of fun. Thanks for your response about covers. I'm adding it to my research. Honestly, I don't pay a lot of attention to covers, especially since the ones that used to make me cringe don't matter as much since I now read mostly on my Kindle. I do read the cover copy and have bought many a book based on evidence of a favorite trope, but the author's name is the motivating factor for most of my book purchases. Nancy, I know you said the Wager of Hearts series is complete, but please tell me that we will get Dr. Ben's story some day. Thanks for your response on the covers, Janga. I have the same issue when I read on my Kindle. Since I never see the cover, I forget what it looks like. I often even forget the title of the book because I also generally choose by author. Covers do catch my eye, but not as much as they used to since I mostly read on my Kindle. Thanks for the update on Pie. That's such great news. Sounds like we all have that issue with our Kindles. I forget what the cover looks like too since I never see it on my Kindle. It's kind of sad because some covers are gorgeous. I'm so happy that Pie's lungs are clear. Woot! Thank you for your concern. The cover can be really important, especially if you haven't read the author before. It gives an impression about the genre of the book - tho sometimes I've been mislead. Gosh, Di, don't you hate it when the cover gives the wrong impression of the book? I've had that happen to me too, and it's frustrating as all get out. I try really hard to make my covers convey the feeling of the story inside. I'm very lucky because my publisher and I work on the covers together. Not all publishers are willing to listen to the author's input, I'm afraid. Some authors get terrible covers on their books through no fault of their own. Some times, I do judge the book by the cover. Love your covers! I think most of us judge a book by the cover. It's pretty and colorful and meant to attract our attention, after all. So glad you like my covers! I do, too. My publisher is great about working on them until they are pretty close to perfect.Thank you! So happy to hear that you are looking forward to reading THE VIP DOUBLES DOWN. I'm glad you know that authors don't always have control over their covers. I'm lucky to have a publisher who is happy to include me in the cover design process, so I think I get pretty great covers. I agree about wanting the hero/heroine to look close to the same as in the book. That's sometimes hard because most covers use stock photos, not photos shot just for the book. But we try hard! Thanks for stopping by! Love your books! I'm praying for Pie! You are so sweet! Your prayers are much appreciated. So glad you enjoy my books! Thanks for stopping by! Hello Nancy! 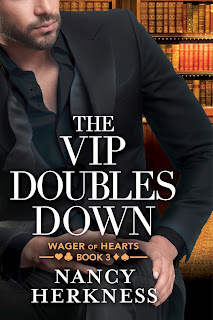 I'm almost finished with The CEO Buys in, Purchased the second book and was lucky enough to win a Goodreads giveaway for an ecopy of The VIP Doubles down. I am loving book 1 and can't wait to finish and find out what happens between Nathan and Chloe. Thanks for the great series. I am thrilled to hear you are enjoying THE CEO BUYS IN so much that you bought THE ALL-STAR ANTES UP. That's the greatest compliment to an author. Congrats on winning the Goodreads giveaway! You're a lucky person. So nice to hear from you! I loved the Wager of Hearts series and I am sad it is finished. I loved Gavin's story and it was a fantastic ending to the series. Tara, I'm thrilled to hear that you found Gavin's story a good ending to the series. I am pretty sure you will see the characters again in my new series. After all, billionaires hang out together, right? LOL! I love those Wager of Hearts guys so much that I can't just leave them behind.